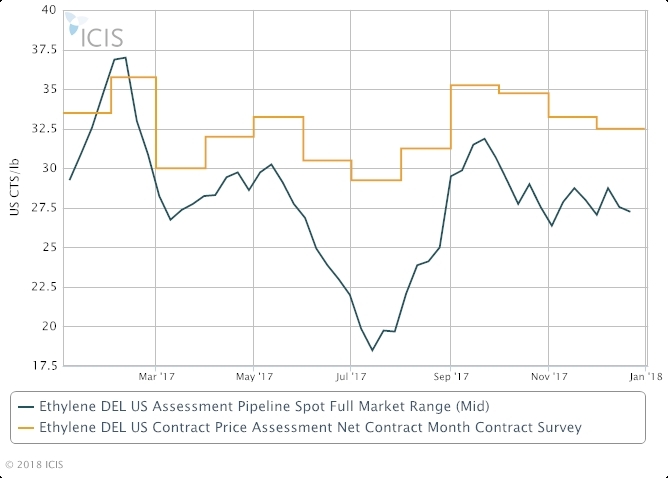 HOUSTON (ICIS)--US December ethylene contracts have settled at a decrease of 0.75 cent/lb from the prior month, market sources said on Tuesday. The settlement puts December contract prices at 32.50 cents/lb ($716/tonne), compared with 33.25 cents/lb in November. The decrease follows lower costs for upstream ethane, which hit a nine-month low in early December. For December, average cash costs fell by 1.8 cents/lb, market sources said. The downward pressure was partially offset by a slight increase for average spot prices, which rose by about 0.5 cent/lb month on month. Spot prices in December were in a narrower range than the prior month. Front-month trades were at 26.75-27.75 cents/lb in December, compared with 25.5-30.0 cents/lb in November. Spot prices have been relatively range-bound in the upper 20s cents/lb for several weeks as the competing pressures of restarting production and delayed cracker projects have kept supply relatively balanced. Several crackers restarted in November following outages due to Hurricane Harvey or due to planned maintenance. The final hurricane-related outage was resolved in December with the restart of a Chevron Phillips Chemical (CP Chem) olefins unit at its Cedar Bayou complex in Baytown. However the returned production was offset by delays for several cracker projects which had been expected to be complete in late 2017. Three of four projects which had been planned to start up before the end of 2017 are now expected to come online in early 2018. Meanwhile, new downstream capacity has come online in recent months, including an ExxonMobil polyethylene (PE) unit in Mont Belvieu, Texas; a Dow Chemical unit in Freeport, Texas; a CP Chem unit in Old Ocean, Texas; and an INEOS Sasol unit in LaPorte, Texas. The new consumption combined with the delayed production projects could tighten ethylene supply in early 2018. US ethylene contract prices typically settle at the start of the month for the prior month.